Unemployment rate decreased to 8.9%, its lowest level in over 3 years. While the jobs reports over the past quarter have been relatively disappointing, given where we are in the cycle, as shown below it actually matches the latest forecast from our office. In December, Total Nonfarm Employment remains 6.5% below pre-recession levels, reached in February 2008, however it has increased from a recession-worst of 8.5% reached in December 2009. 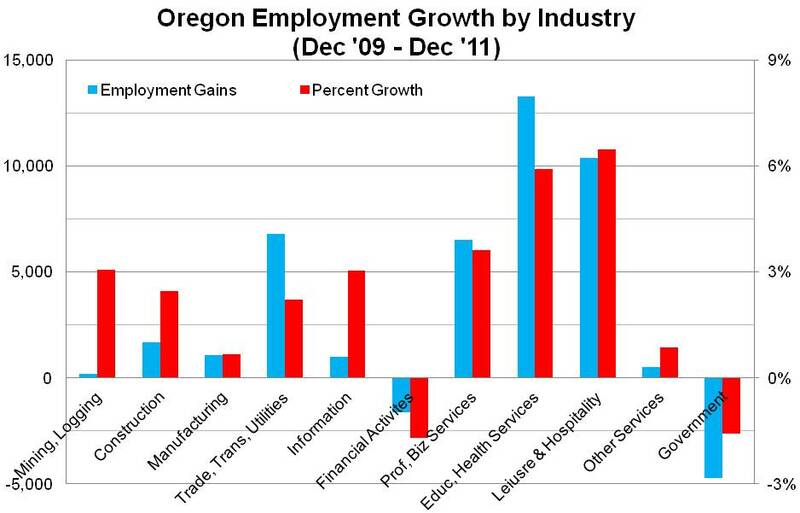 As for industry growth, the graphs below illustrate which industries have seen gains (and losses) in Oregon and compares these figures with U.S. growth. 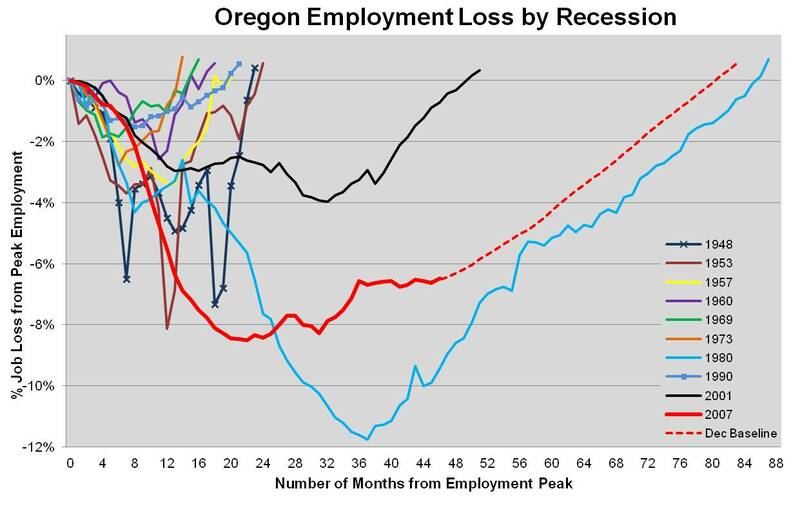 These calculation are based on the past 2 years, or since employment began growing in Oregon (U.S. growth resumed in February 2010.) In Oregon the bulk of the employment gains have come in the Education and Health Services and Leisure and Hospitality industries, which have each grown approximately 6% over the past 24 months. Relative to the nation, Oregon has added slightly more jobs over the past 24 months and has outpaced the U.S. in the following industries: Construction, Information, Education and Health Services and Leisure and Hospitality. 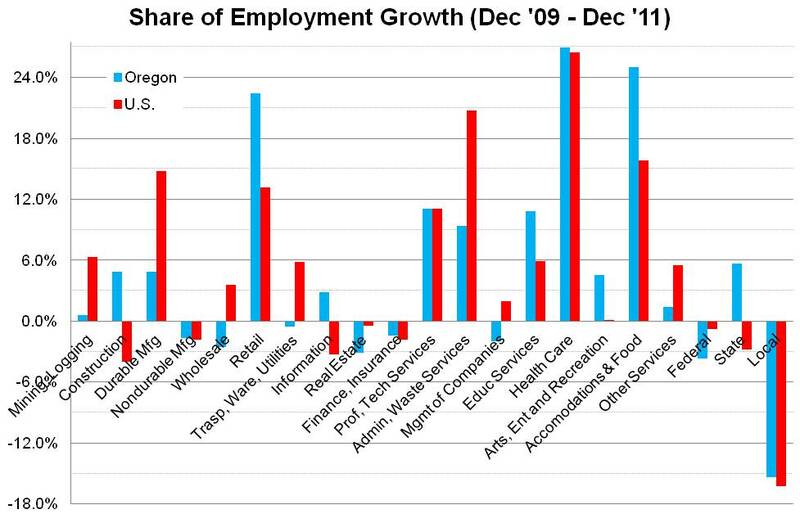 Oregon has also not lost as many public sector jobs as the nation overall. This final industry graph is more granular and detailed. It illustrates the share of growth each industry represents to the expansion over the past 2 years for both Oregon and the U.S. 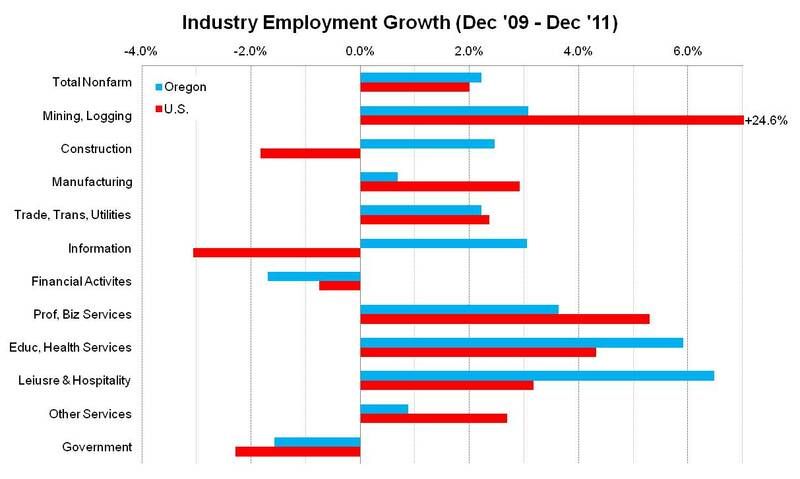 When both the blue and red bars are at equal values, this indicates that that specific industry has contibuted the same amount to growth in Oregon and in the nation overall. For example, Health Care in Oregon represents 27% of the growth and in the U.S. it represents 26.5% of the growth. When the two bars diverge, that means the industry is performing differently in Oregon compared to the nation overall. 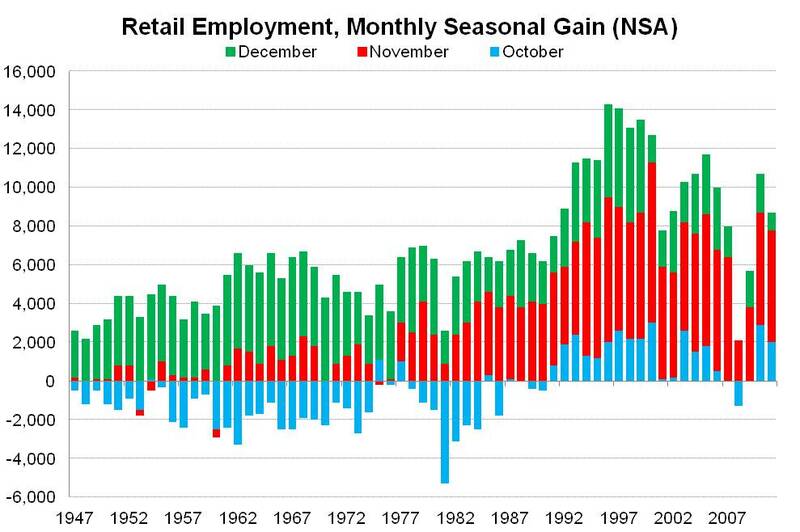 Finally, in December the retail trade industry added 900 jobs over the month on a non-seasonally adjusted basis. This brings the seasonal increase over the last quarter of the year to 8,700 within the industry – a decrease of 2,000 compared to 2010, however stronger than the 2007-2009 years.